I just ousted @robcottingham as the mayor of Point Grey Funeral Parlour on @foursquare! And rest of the world, if you don’t want to wait for my review, you can get Cliff’s book here. Your cartoon is a wonderfully sardonic take on the backchannel. Would you give me permission to reproduce this cartoon on my blog? Love it, Rob. I also think it’s only a matter of time before it happens — if it hasn’t already! Absolutely, Rodd – and I love what you’re doing on your blog! Teachers, there’s some really interesting stuff on education and teaching in the social media era on The Clever Sheep. Thanks, Erik! And the thin edge of the wedge may already be there. This humorous interlude got me to read Dana Boyd’s transcript and I thought it was a pretty good speech. 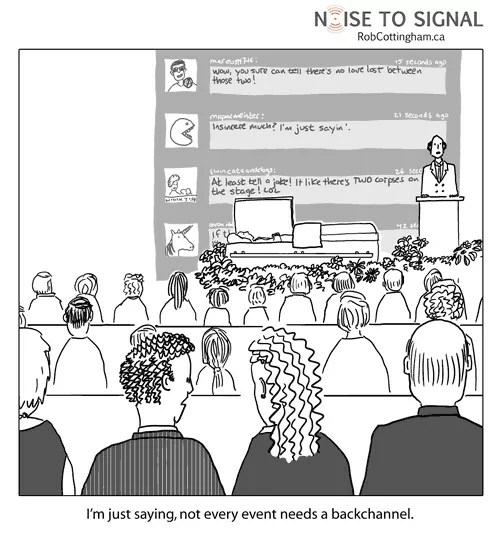 Backchannel has its purpose so long as it does not resemble Bruce Springsteen’s echo of 57 channels (And Nothing On). The word “silence” should be added to “noise” and “signal”, at least with “noise” we know that something is alive. Of course silence can also be a very good thing, for it can be the most thoughtful pathway back to signal . . . which I guess can be called a “closed loop tweulogy”. I guess this closes my loop for this year also, for I am looking forward to some well invested intelligent silence hence forth. Knowing how to finish is a part of starting but letting go is a beginning not an end, so there is a silver lining in everything including coffins. There is nothing to lay to rest here but prime wisdom and learning and that is a very good kind of service that anyone can or at least can choose to attend . . . But please don’t be suprised if we ARE jerks about it – no one ever went broke underestimating the American people (also applies to other peoples, IMH (American) O.